An easy-to-use, free app for Android (iPhones have a compatible app called Signal). It looks a lot like WhatsApp and encrypts your texts, pictures, video and audio files. The app is open-source and provides end-to-end encryption. That means only you and the person you are sending to will be able to read the messages. Another free, open-source app for Android (for iPhones it’s the same Signal app, which combines voice calls and messaging) which encrypts your voice calls end-to-end. All calls are over the internet, so you only pay for wifi or data rather than using your phone’s credit. A free and open-source service to secure your voice calls, video calls, video conferences, instant messages and file transfers. It runs directly in your browser with no need to download anything and allows you to invite multiple people to join a video call. It’s a bit like Google hangouts, but your calls and chats are encrypted end-to-end. There is also a desktop version called Jitsi which you can download for Windows, Linux, Mac OS X and Android. For your web browser lets you encrypt files – including video, email attachments and photos – and share them with friends really easily. You can upload and send your file to selected contacts by using their unique miniLock id, meaning your file can only be downloaded by the person you share it with. A free add-on for your web browser which provides end-to-end encryption for your emails. It can be configured to work with almost any web-based email provider, including Gmail, Yahoo and Outlook. It’s open source and uses OpenPGP encryption. This entry was posted in 1 and tagged amnesty, Communication, security, surveillance, tools. Education: there are increasing numbers of networks offering online courses from most renowned universities such as Harvard, MIT, Berkley, and others. Also, the first completely online university is called Udacity and offers project-based online classes with cases built by tech leaders like Google, AT&T, and Intuit. Newspapers such as the NYT are also engaging in education, creating networks placing their contents at the disposal of potential students. Interactive services: interactive sports sessions on line with a virtual spinning class and virtual bank tellers you can speak to on Skype. 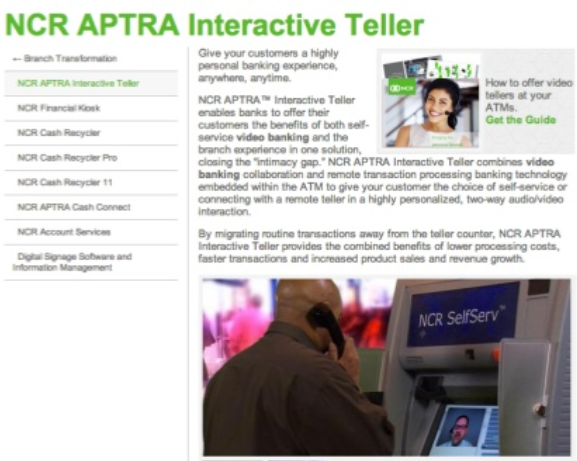 NCR APTRA Interactive Teller enables banks to offer their customers the benefits of both self-service video banking and the branch experience in one solution. This entry was posted in 1, Communication, Social Media and tagged 200ideas, 3d printing, digital media, future, laurent haug, new ideas, privacy, Social Media, Technology, trends, virtual reality. In case you’re overwhelmed or stressed, you don’t need to go for a run or seek therapy. You can turn to a new website created by Alex Tew. You may remember in 2005 he was a student who created the million pixel site, a home page consisting of a million pixels arranged in a 1000 × 1000 pixel grid. Each pixel was sold for US$1 and Alex was able to raise 1 million dollars in less than 6 months. The final 1,000 pixels were actually auctioned off on eBay with a winning bid of $38,100. This new site is called www.calm.com and gives the user choices of relaxing music and images to watch for a set number of minutes. This site is not as viral as the previous one but might be of interest to some. This entry was posted in Communication, Social Media and tagged alex few, calm, stress relief. Some of you might not have heard of this so I thought I would take a moment to summarise this valuable tool. It is particularly valuable for generating creativity in group discussions. It gives everyone a chance to contribute ensuring to a successful outcome without conflict. The Six Thinking Hats is a concept that was established in a book by Edward de Bono, a physician from Malta who has written numerous works about thinking and language and their influence on humanity. The concept helps people think more clearly and thoroughly through the principle of parallel thinking. Parallel thinking guides thought processes in one direction at a time so we can effectively analyse issues, generate new ideas, and ultimately make better decisions. In other words, each member thinks using the same thinking hat, at the same time, on the same thinking challenge. The aim is for members of a group to go beyond their own opinions and focus more on the best way forward as a group. This is done by separating emotion from facts, the positive from the negative and critical thinking from creative thinking. In practice, each member of the group takes on a different role by putting on a different coloured hat. From the diagram below we can see that each colour is associated with a “thinking ingredient”. Therefore, a person with a blue hat might be a good group leader.This person could then agree with other group members on the best order of hats to use. Each hat has a natural pairing with another. For example yellow is positive while black is more negative; red is emotion driven while white is data driven. In general, if you use one hat, you should also use its partner for balance. Here are some examples of successful businesses that have applied the Six Thinking Hats tool. Perhaps it could work for your organisation? This image summarizes it well. For more information, check the de Bono for schools site. 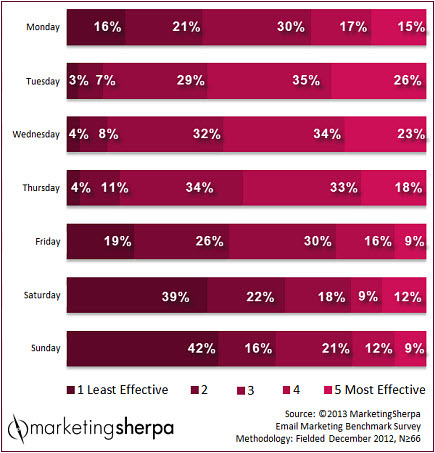 In case you didn’t already know, Tuesdays are the most effective days to send emails. A recent study conducted by MarketingSherpa confirmed it. This entry was posted in Communication, Social Media, Social media and business and tagged email, marketingsherpa. This is an interesting platform justdelete.me, which provides insights into how to manage/delete your profile from various networks. What’s interesting is not just the fact that surprisingly difficult to delete your profile from some platforms such as Evernote, Pinterest, Youtube, and even WordPress, but also how many different networks are available today. Of course it doesn’t cover all of them but some of the most popular ones. Remember the chat programme ICQ? It was the fist internet chatting system and very popular in 1996. It is also virtually impossible to delete your information without sending a special request to the owners, now a Russian organisation Digital Sky Technologies. With the number of Internet platforms available growing rapidly, it’s worth taking some time to try to manage your digital platform. This entry was posted in Social Media, Social media and business and tagged delete, platforms, profile, social networks. Click here to download the full report: Brave New Digital World: A Manifesto for the Future of Digital Measurement & Analytics. This entry was posted in Social Media, Social media and business, Social media measurement and evaluation and tagged Audience Measurement, Connected Devices, Marketing Research, Mobile, Technology, Web Analytics. Comminsight is a blog about communication, past, present and future! I hope to inspire readers to explore different perspectives of communication and learn to communicate efficiently both about themselves and their organizations.